ICTlogy » ICT4D Blog » Book Chapter: Key factors for successful ICT4D projects: How can telecoms contribute. Home » ICT4D Blog » Book Chapter: Key factors for successful ICT4D projects: How can telecoms contribute. Book Chapter: Key factors for successful ICT4D projects: How can telecoms contribute. ESADE‘s Institute for Social Innovation has just published a new book authored by Mar Cordobés and Beatriz Sanz, and coordinated by Sonia Navarro: TIC, desarrollo y negocios inclusivos [ICT, inclusive development and businesses]. The book deals about Information and Communication Technologies for Development (ICT4D) but, provided that ESADE is a business school, the approach heavily relies on the role of businesses in achieving this development through ICTs. The book begins with two initial chapters on ICTs in social inclusion and the role of global businesses in development under the approach of “inclusive markets”. The second part of the book is made up by an analysis of several cases in the field of e-commerce, e-agriculture, learning and training, e-health, e-governance or online volunteering, to name a few. Manuel Acevedo: ICT and human development in Latin America. Mireia Fernández-Ardèvol: Mobile communication and social development in Latin America. Ismael Peña-López: Key factors for successful ICT4D projects: How can telecoms contribute. Vanessa Frías-Martínez: Mobile phones and emergent markets in Latin America. In what concerns my book chapter, Key factors for successful ICT4D projects: How can telecommunication businesses contribute to the advancement in ICT4D, I begin speaking about general concepts like development, the Information Society and their relationship. I go on stating that digital infrastructures do not necessarily lead to social development, being them “only” a necessary but not sufficient condition that goes in parallel with other important aspects such as a powerful industry, digital literacy, a regulatory framework, or a wide supply of digital content and services. To lower down the “last” barriers of access in what refers to infrastructures: usability, accessibility and affordability. Once physical access is no more an issue, to work for utility, capacity and e-awareness. That is, to raise awareness not only on what can ICTs can be used for, but on how they are transforming our lives and creating new arrays of exclusion for those that do not skilfully use them. Last, but not least, to mind the context: ICTs are a tool and, as such, they multiply the reality they are used in. In this sense, it is very important to remind that ICTs stand for “information” and “communication” technologies, and thus the knowledge gap is a hypothesis that is increasingly been backed up with evidence. 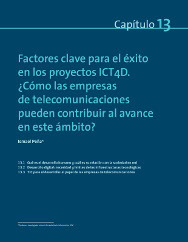 “Factores clave para el éxito en los proyectos ICT4D. ¿Cómo las empresas de telecomunicaciones pueden contribuir al avance en este ámbito?“. En Cordobés, M., Sanz, B. & Navarro, S. (Coord.) , TIC, desarrollo y negocios inclusivos, Capítulo 13, 183-192. Madrid: Fundación Telefónica, Editorial Ariel. Download from the official website. Cordobés, M., Sanz, B. & Navarro, S. (Coord. ), (2012). TIC, desarrollo y negocios inclusivos. Madrid: Fundación Telefónica, Editorial Ariel. Peña-López, I. (2012) “Book Chapter: Key factors for successful ICT4D projects: How can telecoms contribute.” In ICTlogy, #111, December 2012. Barcelona: ICTlogy.